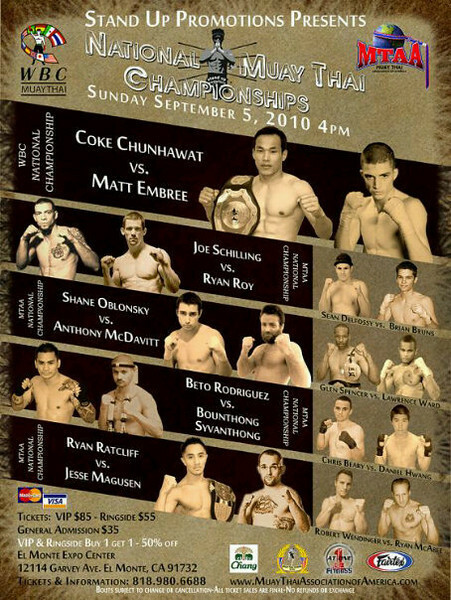 It looks like the WBC Muay Thai is keeping a reasonably busy schedule ahead of them for the 2nd half of 2010. Standup promotions this time is coming with a new offering featuring Phunawat ‘Sugar Cane Coke’ Chunawat fighting for a WBC National Title against Toronto, Ontario Canada’s Matt Embree. I am not sure at what weight this title is going to be contested for by I know in the past Matt Embree fought as low as 126lbs though he is quite tall for his weight. Coke in his last WBC title bout was noticeably smaller than his opponents in past fights. So this would will be interesting in size and style matchups again. Also is this the lowest weight a main event Muay Thai card has ever hosted in the United States? Joe Schilling will take on Ryan Roy. Also three other MTAA titles will be fought for. Shane Oblonsky will fight Anthony McDavitt. Ozzy Venegas who recently fought for an IAMTF title will be matched against Bounthong Syvanthong, and Ryan Ratcliff will fight Jesse Magusen. The rest of this card is on the poster. Click the poster for a bigger version of the image. The return of Joe Schilling and Ozzy Sityodtong ! AKA INTENSE !!!!! Should be pretty interesting. Montri has done some BIG time stuff in the past. Gonna be a great fight for Embree…. is he still fighting in Thailand or is he back in Canada again?